The past year was a very eventful and very significant one for The Federation. We began the year preparing for an important provincial election—partnering with Federation members on a series of editorials, creating a ‘get out the vote’ campaign with our partners, and meeting with parties and candidates. Then, in what seemed like no time, we shifted gears and began building and managing our relationship with the new BC government. We had worked long and hard to prepare and position ourselves for that moment. There were many new opportunities to take advantage of and many important steps required to plot our course for the coming years. The Federation board and I met with new ministers, we included them in Federation conferences, strengthened existing relationships with our civil servant colleagues, and made important connections with the new Ministry of Mental Health & Addictions as well as the Ministry of Social Development & Poverty Reduction. The contributions of our membership and the efforts of our Board of Directors are what laid the groundwork for this new chapter. Their strength, experience, and passion got us to where we are today. And I feel more confident than ever about The Federation’s position and our ability to speak out (and be listened to) about the things we care about most: sustainable funding, community engagement and collaboration, leadership development, improving services to children and youth in care, reconciliation, and the importance of a strong and compassionate community social services sector. 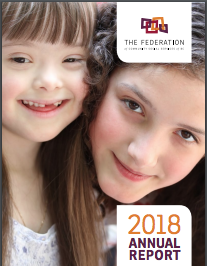 Read The Federation’s complete 2018 Annual Report here.